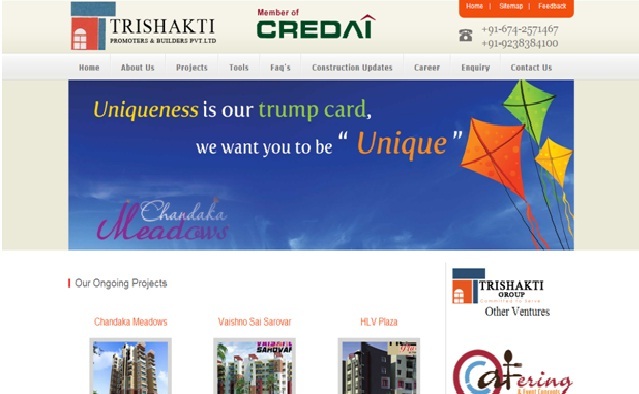 Trishakti Promoters and Builders is a leading infrastructure development company located at the temple city Bhubaneswar, Odisha. This company is achieved its reputations over the years and committed to provide affordable housing projects like simplex, duplex, apartments and plots in the best locations of the city. This company has best solutions for housing projects meet the International standards with 24x7 customer’s support. The Directors of this company are Er. Pramod Kumar Mohapatra and Er. Umash Patnaik. This project is located at Hanspal, Bhubaneswar, Odisha, India. The number of apartments is 30. The two types of flats are available such as 2 BHK, 3 BHK and the cost price per sqft is 2500/- (around $50). The features of this project are approved by BDA and Banks, 24 hrs Security, 24 hrs Water supply, 24 hrs Power back up, Community hall and Garden. This project is located at RangaBazar, Tankapani Road, Bhubaneswar. This project provides economically designed 2 types of flats like 2 BHK and 3 BHK and the cost price per sq ft is 1800/- (around $35). This project is at Chandaka, Bhubaneswar, Odisha. This project is consist of 5 towers such as A, B, C, D, and E. The features of this project are Greenery atmosphere, Children’s play ground, Cricket pitch, Basket ball court, Indoor games like cards, chess, and carom, Library, Special rooms for dance and music classes, Multi gym for gents and ladies, Retail shops, Medicine store with dispensary, ATM and 24 hrs Security. This project is located at Rasulgarh, Bhubaneswar, Odisha. This project has various features such as approved by BDA and Leading Banks, A/C Community hall, Cable TV facilities, 24 hrs water supply with bore well, Fire fight system, CCTV camera facility, Children’s park, Jogging track, Indoor hall, Club with multi gym, and Open parking space.